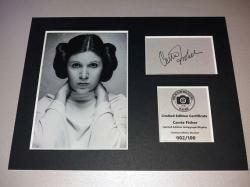 This May 4th our Sci Fi Auction IS NOW LIVE! 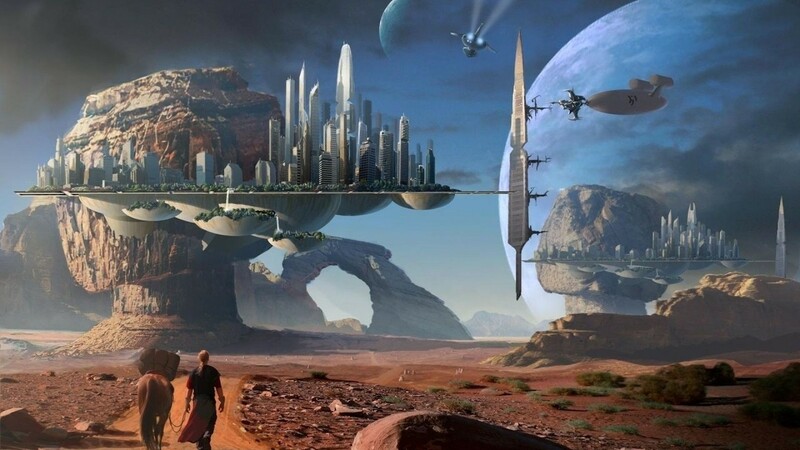 Featuring YOUR Favourite Sci Fi Worlds! You will be required to pay actual shipping cost for your winning lot (ALL items will be sent by insured postage). 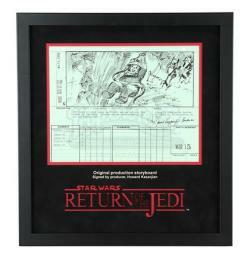 RARE Return of the Jedi SIGNED STORYBOARD! An original production used storyboard copy from the epic George Lucas saga, Star Wars: Return of the Jedi. This stunning storyboard came from a complete set created for the visual effects sequences and offers a truly fantastic and rare insight into the making of the movie at such an early stage of the production. This Storyboard is signed by Producer Howard Kazanjian. The storyboard is one of a complete set created for the visual effects shot-by-shot sequences. This board shows an Ewok pursued by Bikers in the well known scene in Return of the Jedi! It is labelled as shot “WR 15”. The storyboard features an image of Kieeco swinging up into the trees, as two Stormtrooper bikers are in pursuit. The information on the page includes which sequence it was involved in, the shot number, sequence and a brief printed description underneath. The storyboard is printed on a sheet of green-coloured paper and it is hole punched at the top from where it was grouped in sequence, forming a comprehensive shot by shot miniature version of the movie’s spectacular and ground breaking effects. The storyboard comes beautifully presented in a custom-built frame with a laser-cut mount board featuring the classic movie title. The display is in excellent condition. The white corners are to protect the frame and are under the protective film for shipping only. Minimum bid is £53 (Bid increments are £3). Get ready for a brand new way to experience and treasure the movies you love, with the Big Sleeve Edition. 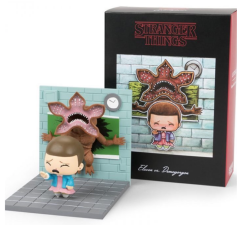 Presented in a stunning 12-inch sleeve, this beautifully-crafted collector’s item comes with a Blu-ray and DVD of the movie, and exclusive 12 inch art cards you’ll cherish forever. So take home a movie experience the whole family will enjoy, with The Big Sleeve Edition! * Audio Commentary with J.J. Abrams – Enter the mind of visionary director J.J. Abrams as he reveals the creative and complex choices made while developing the first film in the new Star Wars trilogy. * Foley: A Sonic Tale – Foley artists, consisting of old pros and new talent, unite to bring the world of Star Wars: The Force Awakens alive through the matching of sound to action. * Sounds of the Resistance – Hear how the epic sound design. Star Wars: The Force Awakens moves the Star Wars legacy forward. * Deleted Scenes – View never-before-shared scenes that didn’t make the film’s final cut. * Dressing the Galaxy – Costume designer Michael Kaplan reveals how the costumes of the original Star Wars movies were re-envisioned for a new generation. *The Scavenger and the Stormtrooper: A Conversation with Daisy Ridley and John Boyega – The two new stars share the thrill of working together on the adventure of a lifetime and becoming part of the Star Wars legacy. *Inside the Armory – Take a fascinating tour through the design and creation of the weaponry in Star Wars: The Force Awakens. Minimum bid is £122 (Bid increments are £2). 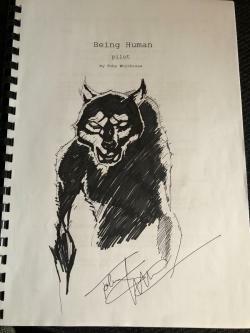 This auction is for a copy of the Being Human Pilot scrip signed by creator and writer Toby Whithouse (Dr Who). Toby has also handdrawn a werewolf on the cover! 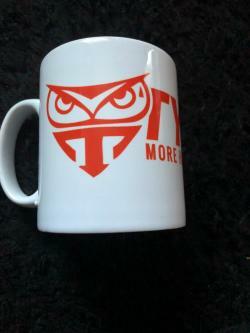 Signed in person by Toby this one of a kind item comes with a COA! This is another amazing auction piece. 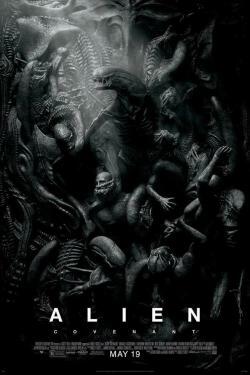 A poster of Alien Covenant SIGNED BY GUY PEARCE! 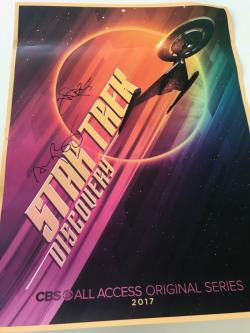 This poster was signed in person by Guy on a recent trip to London and will be accompanied by a COA. 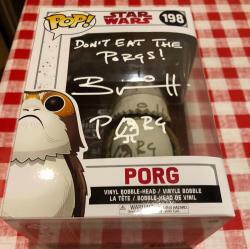 This NEW in BOX SIGNED Porg Pop! Figure has been signed and donated by Brian Herring. Signed in person for Cabaret vs Cancer this piece will come with a Certificate of Authenticy. 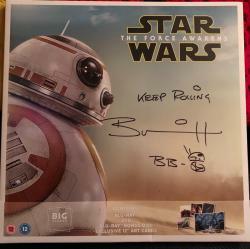 Brian Herring, puppeteer and actor, who worked as one of the two performers for BB-8 in Star Wars: Episode VII The Force Awakens, and reprised his role for Star Wars: Episode VIII. 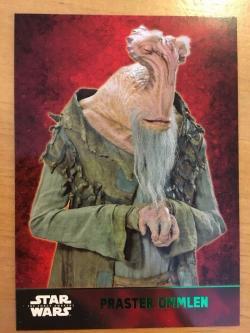 He had also worked as a creature and droid performer (including SE-2) in Rogue One: A Star Wars Story. 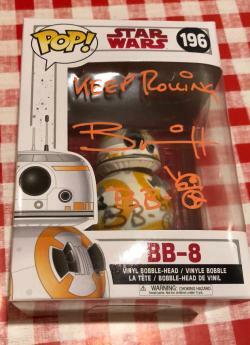 This NEW in BOX SIGNED BB8 Pop! Figure has been signed and donated by Brian Herring. Mason, also known as BENJAMIN LOUCHE, award winning host of the Double R Club is also a trustee of Cabaret vs Cancer. Minimum bid is £88 (Bid increments are £3). 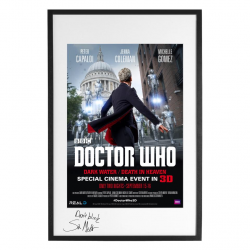 This poster advertising the cinema release of Dark Water/Death in Heaven signed by STEVEN MOFFAT! This piece is framed and will be shipped well protected and ready to hang! This is a listing as last years bidder didn’t pay! 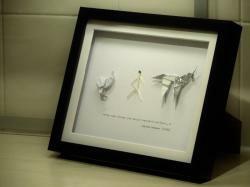 This has A4 print has been donated by CMatthewman Design. 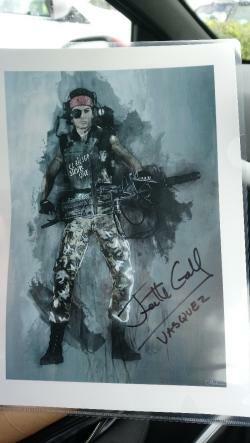 Last year he had the pleasure of meeting Jenette Goldstein, in person, who played Private Vasquez in the 1986 movie Aliens. As well as being an awesome lady she also signed a few things including this piece! The signature is 100% genuine and not printed on the image. See attached for a pic of her signing it. 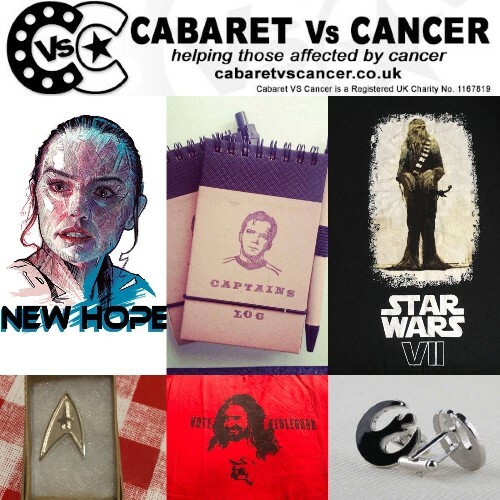 A COA will also be provided by Cabaret vs Cancer! 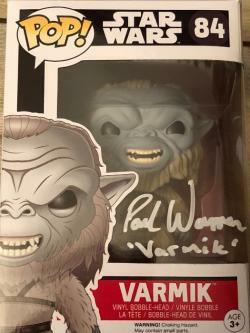 A signed Varmik Funko Pop! Signed and donated by Paul Warren! 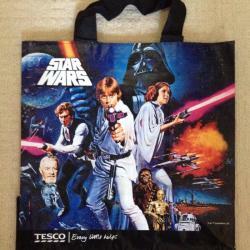 Minimum bid is £56 (Bid increments are £2). A set of StarWars BB8 Crew CFX crew merch. This set is VERY RARE! 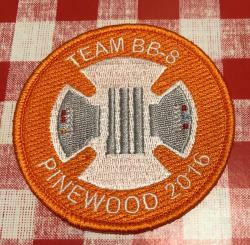 This patch & sticker were only available to the BB8 crew. 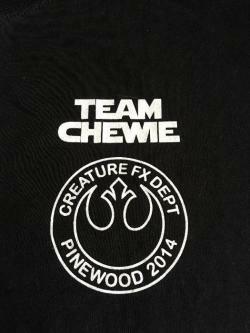 A set of SOLO CFX crew merch. 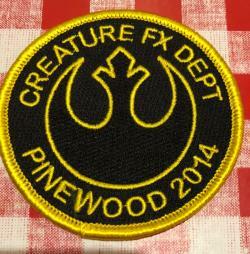 This patch & sticker were only available to the crew. 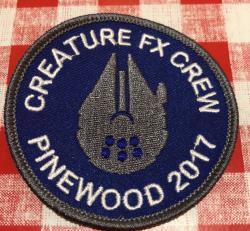 A set of Rogue One CFX crew merch. 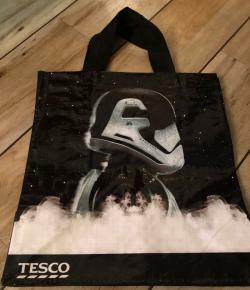 A set of StarWars VIII, The Last Jedi CFX crew merch. 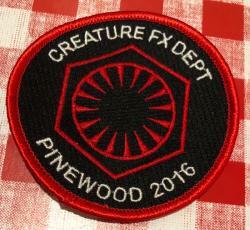 A set of StarWars VII, TheForceAwakens CFX crew merch. 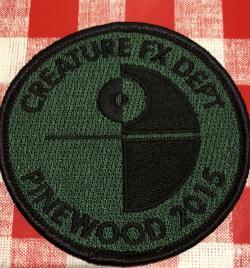 This patch & sticker were only available to our crew. 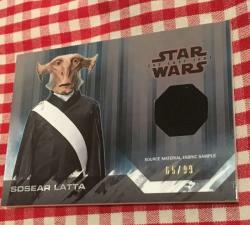 This card will be signed TO YOU by Mason Ball - creature performer of Praster Ommlen in The Force Awakens. This is your only opportunity to get a signed trading card from this creature performer. Mason is also known as BENJAMIN LOUCHE, award winning host of the Double R Club is also a trustee of Cabaret vs Cancer. 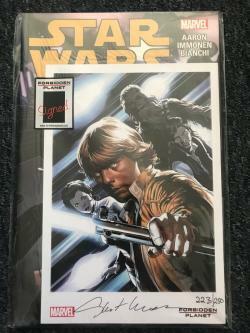 2015 Star Wars Book 2 SIGNED! Faithful recreation of the iconic lightsaber prop used by Luke Skywalker in Star Wars: Episode VI - Return of the Jedi. As with my Obi Wan, New Hope, kit, this legendary piece has been meticulously re-created after spending countless hours pouring over reference photos, movie stills and delving down the endless rabbit holes that are replica prop forum posts. This kit is designed to mimic each and every feature from the original prop in as fine a detail as 3D printing will allow. The 3D model used here is an entirely original design, created by myself, with a focus on producing an easy to finish and assemble prop that fixes issues commonly found in other models floating around the internet. Dimensional inaccuracies, missing details (especially those smaller details found in the control section), or simply just the mistake of being too perfect, this kit tries to correct these errors, paying homage to the minute imperfections and idiosyncrasies found in the screen used props. 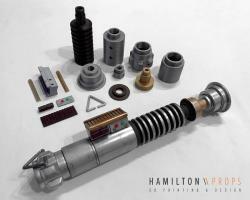 As with all of the lightsaber kits I produce, this is designed to be entirely hollow throughout. This cuts down on weight (great for cons), but also allows you the benefit of installing LED's, electronics, or even simply weighting the finished piece to feel like a true Jedi weapon. 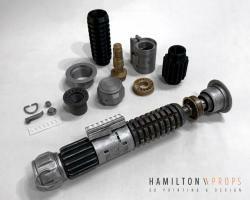 The main body of the lightsaber is designed to be screwed together, with threads in each sections, allowing you to easily disassemble and assemble the prop at any point, again, to facilitate the instillation of electronics (though its also great for painting and excitable mock ups). The control section will snap together with a tight friction fit, though it can be easily separated for finishing without the worry of awkward masking (I highly recommend glueing this together for final assembly however). The kit is printed in incredible detail (0.1 micron layer height), using PLA, either in a single colour (white, grey or black, depending on stock, please message beforehand if you have a specific colour request) or with each part printed in its respective colour, giving you a pretty accurate prop right out the gates. For a full list of specific products and processes, please feel free to get in touch, I have an in-depth list of supplies used and a step by step finishing process that I'd be more than happy to share. I may also have a YouTube video or blog post detailing this entire process soon so keep an eye out if you want to wait for that. Minimum bid is £38 (Bid increments are £3). Faithful recreation of the iconic lightsaber prop used by Obi-Wan Kenobi in Star Wars: Episode IV - A New Hope. Thrown together with WWII grenades, camera flash parts, jet engine pipes and even tap heads, the original lightsaber, weilded by Alec Guinness in 1977, has such a rich and interesting history. This has been meticulously re-created after countless hours pouring over reference photos, movie clips and forum posts, designed to be as close to the original screen-used prop as plastic will allow. This is an entirely original 3D design, created by myself, mostly in response to the unfaithfulness of the models currently floating around the internet. Missing details or inaccuracies are fixed here, the Graflex font, the line details, the vertical cut in the gold shaft, the floating transistor buttons, the tap head pommel details, dimensions dimensions dimensions, everything has been accurately mimicked to give an honest representation of the screen-used prop. The lightsaber is designed to be entirely hollow throughout, cutting down on weight (great for cons), but also allowing you the benefit of installing LED's, speakers, logic boards, or even simply weighting it to feel like a true Jedi weapon. The saber is also designed to be screwed together (no glue needed! ), with threads in each sections, allowing you to easily disassemble and reassemble the prop at any point, again, to facilitate the instillation of electronics, though its also great for painting and excitable mock ups. The kit is printed in incredible detail (0.1 micron layer height), using PLA, with each piece printed in its respective colour. This means, even out of the box you have a pretty accurate looking prop already (though, for a slightly reduced cost, the kit can also be ordered with all parts in a single colour, either printed in white, grey or black, depending on stock, if you have a specific request, please message me beforehand). 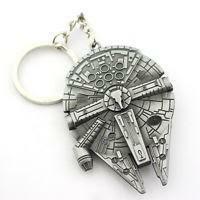 This is the Millennium falcon from star wars, of course. But now you can use this iconic spacecraft as your own personal serving platter. Delight your dinner guests as you captain the falcon from the kitchen to the dinner table or exploit the sublight drive for maximum chopping speed. With some gentle highlights carved into the face this cutting board will not only stand out but be rather functional. What more could you want? The reverse side is left blank so you can use it as a normal cutting board. Carved in London from one of the best renewable sources and the fastest growing plant on the planet, bamboo. Extremely hard wearing and durable with the beautiful natural grain of bamboo, a must have for any kitchen. 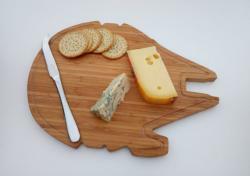 Also makes a galactic cheese board. Comes pre oiled with 100% food grade mineral oil for a lasting finish. 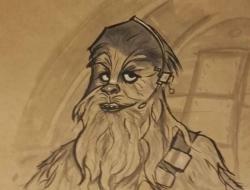 This OOAK Pen & Ink Artwork of Chewbacca by illustrator Pip 'Astro' Bayley comes in an A3 frame. 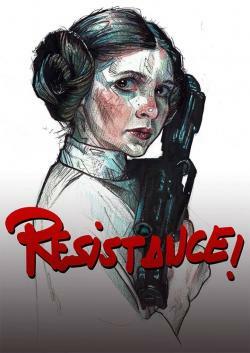 Princess Leia by Subversive Girl - INCREDIBLE! 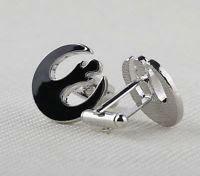 These have arrived at CvC HQ and we are BLOWN AWAY BY THEM! 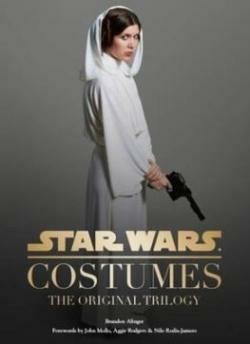 Very high quality matte prints about a fanart of the Princess Leia Organa from original "StarWars" saga . Done with penballpoint, colorpencils and photoshop. 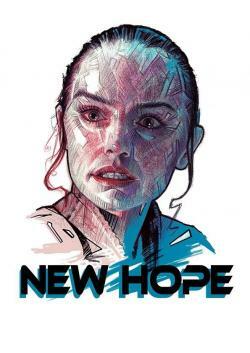 Rey - A New Hope - AWESOME PRINT! This is a second awesome piece from Subversive Girl. 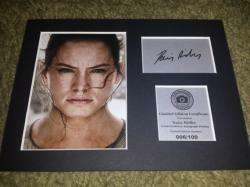 Very high quality matte prints about a fanart of the Rey from the new "StarWars" saga . Done with penballpoint, colorpencils and photoshop. Signed. For the true Blade Runner fan, this premium framed collection of Gaff's (Edward James Olmos) iconic origami figurines makes for a stunning memento of the film's epic journey. Card mounted in a sleek 20x25cm (8x10") box frame with a hand typed quote underneath. This unique, digital images are printed onto high quality photo paper. Prints are A4 sized (210x297 mm 8.3 x 11.7 in) so will fit into a standard off the shelf frame. 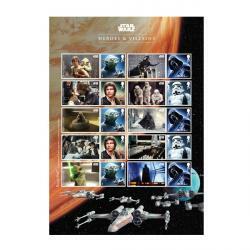 THIS SHADOW BOX FRAMED GIFT MAKES THE IDEAL GIFT FOR A STAR WARS LOVER IN YOUR LIFE! • High quality of frame and backboard for a sturdy and long lasting product. • Hangs very easily on a wall or can stand perfectly on a flat surface. •	Each frame comes with a plastic front which can be used to protect the minifigures from dust, as well as keeping them out of reach from children. But can also be removed for ease of access. Please be aware that a protective cellophane layer is included, easily removed, but left for your removal to protect in transit. 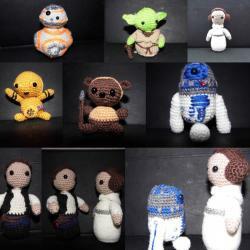 A full set of handmade crocheted Star Wars figures! 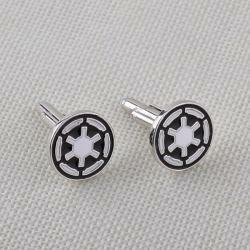 A must for any style conscious Star Wars Fan! Minimum bid is £23 (Bid increments are £3). 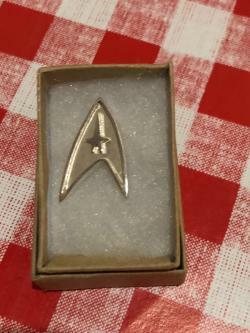 This auction is for a wonderful sterling silver pin. 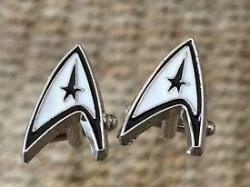 These fantastic Star Trek cufflinks are a must for all Trekies! Rare & New Star Wars Stormtropper soap! 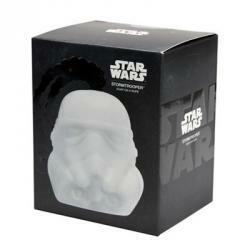 This auction is for a STORM TROOPER SOAP ON A ROPE, new and still in box. Minimum bid is £4 (Bid increments are £2). 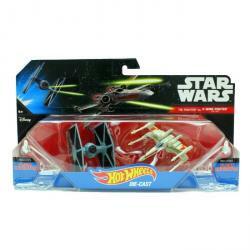 Two of your favourite brands - Hot Wheels and Star Wars - have joined forces! Launch into hyperdrive with some of the most iconic vehicles from Star Wars and re-create some of the universe’s most epic battles and fiercest showdowns with these starships. Slip on the Flight Navigator, raise your hand and send your Starship “flying” across the room—just like in hyperspace! The Flight Navigator also doubles as a display stand to show off a collection. 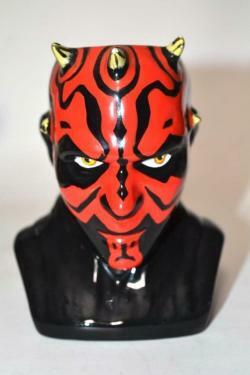 Darth Maul porcelain mug, complete with certificate of authenticity and in the original box. NEW and never used, however the box does have some wear to it. This is a prized collector item and is not dishwasher safe or microwave safe, it's made by Applause. 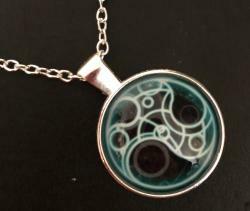 Inspired by Doctor Who, a dark blue background with hot pink and Tardis blue features. This pouch has a dark blue zip with gold metal teeth. A dark blue, soft, jersey material lining. Soft to the touch for grabbing your items inside. 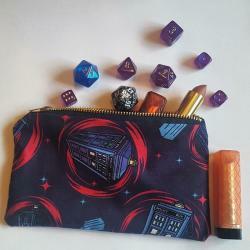 The outside Tardis fabric is a sturdy cotton, giving the pouch structure. The zip is a strong gold metal zip and is easy to pull. Thread used is a dark blue strong cotton thread. 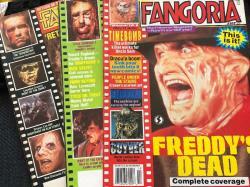 This is a lot of three vintage FANGORIA magazines! 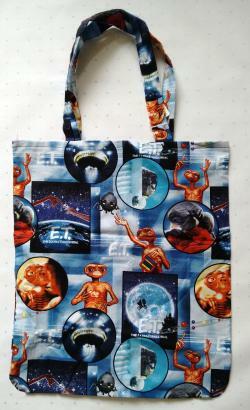 Featuring fold out Alien poster, Terminator T2 feature, The Fly feature and more! 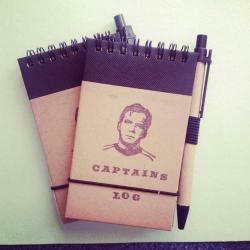 Notebook and pen showing captain Kirk with 'Captains Log' written at the bottom. 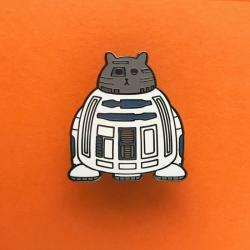 Star Wars Pin Set of Four Pins! The villains of Star Wars; the Stormtroopers, Boba Fett and Darth Vader, with the iconic Death Star. Some of the most iconic baddies to come off the big screen. 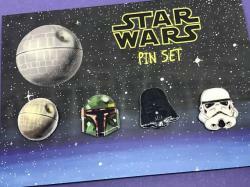 You can now show your love of the Sith with this pin set, featuring the helmets of Darth Vader, Boba Fett, and a Stormtrooper. 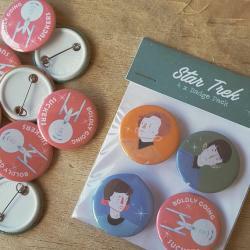 All pins have been finished with a lapel pin back. Make sure to keep your pins away from perfume and water. The pins measure approximately 4 cm tall. Due to the nature of shrink plastic, the set you receive will be slightly different to the ones photographed, which only adds to their charm. Because its Fat Kitty, expect him to be massive! He measures 3.5cm in hight and 3.2cm wide. The back is finished in black, so it really makes Fat Kitty pop out at you! He comes with a 2 butterfly clasps, so you can be sure he will stay safely affixed to you. 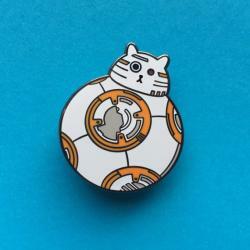 BB8 from Star Wars 7: The Force Awakens is basically a rip off of the real Fat Kitty: white and orange, round, a bit sassy and struggles with stairs... need I go on? Because its Fat Kitty, expect him to be massive! He measures 3.5cm in hight and 3cm wide. The back is finished in black, so it really makes Fat Kitty pop out at you! He comes with a 2 butterfly clasps, so you can be sure he will stay safely affixed to you. *I know, wrong film and wrong droid! 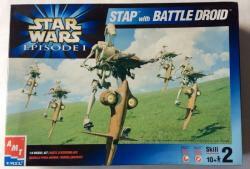 This is an ERTL AMT STAR WARS STAP WITH BATTLE DROID MODEL KIT. Scale is 1:6, so if you've ever wondered how big these things actually are, now's the time to find out! Condition is very good, the box has been opened, but the plastic bags inside are still sealed. 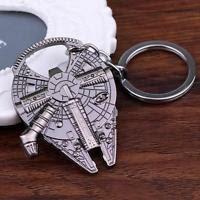 Millenium Falcon Keyring and Bottle Opener! 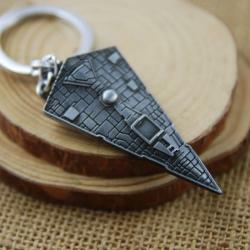 Where to keep the keys to your Millennium Falcon? Complete with handy BOTTLE OPENER! Porg inspired Star Wars keyring/keychain. Also includes second pocket size Porg! This cute little companion is handcrafted from wood and is hand painted in acrylic paints. It is sealed with a non-yellowing sealant. Each adorable Porg (Space Puffin) has been carefully painted with my own two hands - so they will be unique to you - no two will be exactly alike. 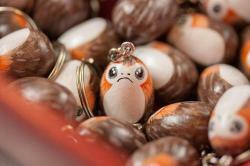 The Porg is 3 cms and with the length of the keychain it's approximately 8 cms. Who better to guard your keys than a Porg! 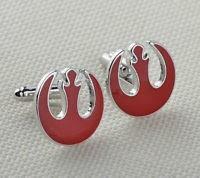 Perfect gift for any Star Wars fan! Daisy Ridley as Rey from the Star Wars film series. ● Fully mounted and backed so can easily be framed. ● Posted in protective envelopes to prevent damage in transit. 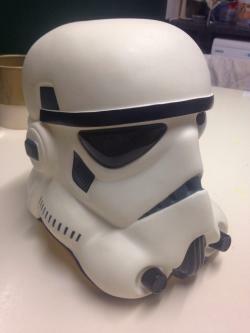 This auction is for a vintage unboxed 1999 Don Postmask Stormtrooper helmet. Stormtrooper Helmet - 1999 Don Postmask under license to Lucas Film Ltd.
Made in the last year Don Post Studios held their license for replica Star Wars helmets (1977 to1999). Cast in a hard, white plastic, with simulated breathing filters and comlink units. No internal padding. Made in China. Great overall condition with some light storage marks - please see pictures. The Classic Actions (CA's) Stormtrooper Helmets were more accurate than their budget counterparts and were fabricated from the same moulds as the Deluxe range - however were made of Vinyl rather than fiberglass. 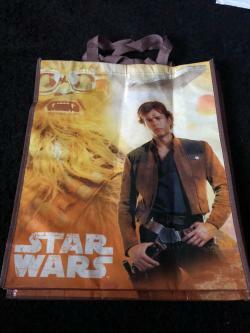 This auction is for a new Solo bag from the Disney store ! 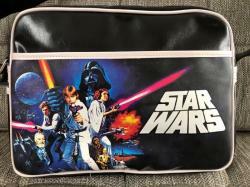 This vintage Star Wars bag measures 14 inch across front, is 9 3/4 high, 5 inch wide at base, and 4 inch wide at top of side. 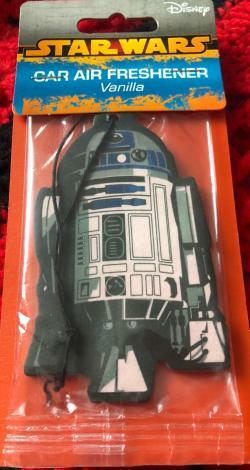 Star Wars: RS-D2 Car Air Freshener! This air freshener is new in packet and vanilla fragrance! 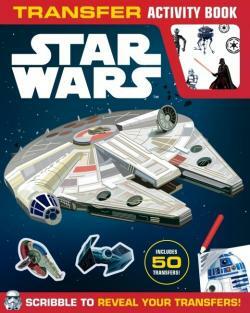 The Force is strong in this bumper poster activity book featuring the heroes and villains of Star Wars: The Force Awakens - packed with puzzles, codewords, mazes and more – plus a giant full-colour The Force Awakens poster and more than fifty stickers. 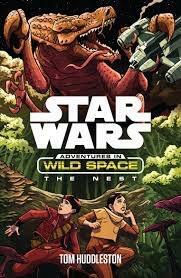 All new activities based on the Star Wars saga. Use your transfers to create epic battle scenes, complete mind-boggling puzzles and design your own Star Wars character. Includes mazes, Sudoku, a crossword, colouring and much more! Bespoke artwork featuring aliens, droids and creatures from across the entire Star Wars saga, including images of classic vehicles, Millennium Falcon, X Wing and Death Star. PS – Look out for the stamps with hidden features! Handy hint, only visible under UV light. Droids enthusiast? Look no further than this Special Stamp Set, which includes two sets of Droids stamps on a bespoke persentation card, depicting two of our favourite droids; BB-8 and C-3PO. 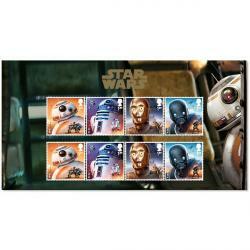 Droids stamps include fan favourites BB-8, R2-D2, C-3PO and K- 2SO. The stamps are protected by clear plastic strips ensuring they stay in perfect condition. 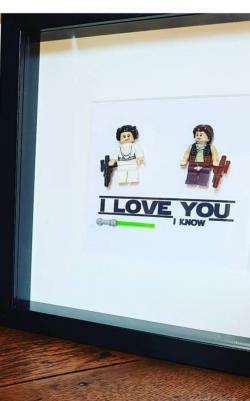 Don't forget to look a little closer for extra features on the Droid stamps. Handy hint, only visible under UV light. 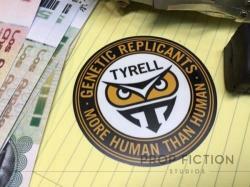 This auction is for two Blade Runner DeCal Stickers! This is a rare opportunity to own this highly sought-after prop Tyrell equipment sticker / folder emblem / set dressing decal. This reproduction prop is professionally printed using the best quality materials. 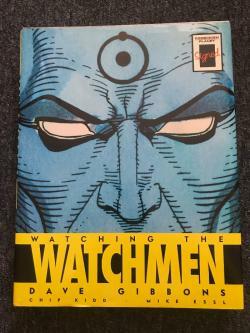 It is created using traditional film and television art department techniques for added authenticity and so is perfect for on-screen or display use. 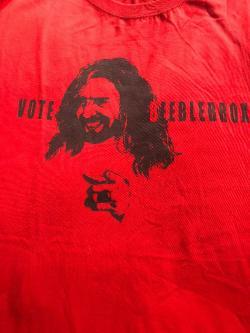 Note: This auction is for a premium-grade weather resistant vinyl decal as pictured. The decal measures approximately 85mm x 85mm. These durable stickers feature a premium coating that protects them from exposure to wind, rain and sunlight. This is a rare opportunity to own this highly sought-after spinner prop vehicle sticker / emblem / set dressing decal. This reproduction prop is professionally printed using the best quality materials. 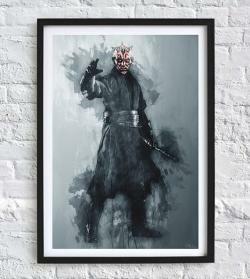 It is created using traditional film and television art department techniques for added authenticity and so is perfect for on-screen or display use. Note: This auction is for a premium-grade weather resistant vinyl decal as pictured. 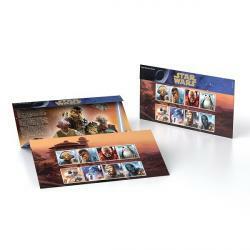 The decal measures approximately 110mm x 74mm. These durable stickers feature a premium coating that protects them from exposure to wind, rain and sunlight. Trivia: Ridley Scott and Jordan Cronenweth achieved the famous 'shining eyes' effect by using a technique invented by 'Fritz Lang' known as the 'Schüfftan Process'; light is bounced into the actors' eyes off a piece of half mirrored glass mounted at a forty five degree angle to the camera. 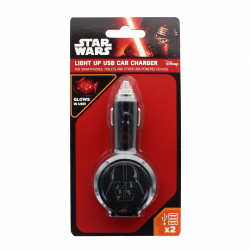 LIGHT UP DARTH VADAR USB CAR CHARGER!